It has been six years since my first domestic flight. It was a school activity that we had to attend in Dumaguete during my last year in college. We flew via AirPhilExpress. During that time, it was still called Air Philippines and if my memory serves me right, the fare then was 3000+ each. But with these non-stop airline seat sale promos I was able to make 9 "cheap" trips (5 international, 4 domestic) via PAL, Cebu Pacific, Tiger Airways and Air Asia within 2 years. 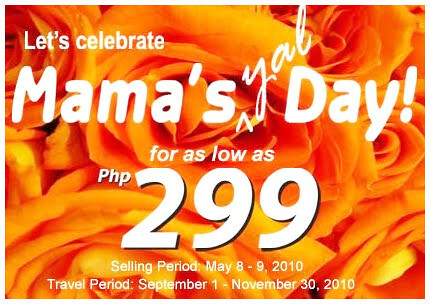 Last May, AirPhilExpress' Mama’s^yal Day Seat Sale caught our attention. So my HS kaladkarin buddies and I have booked RT Naga tickets for October at 600+ each. I was also able to book 2 tickets (for me and the BF) for November for only PHP352 each (one way Kalibo-Manila). The Manila-Kalibo and Manila-Caticlan flights were not on sale then so I had to wait for another airline sale. 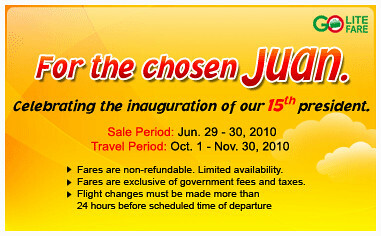 June came then it was Cebu Pacific's turn to have their super sale. I got 2 golite Manila-Caticlan tickets at PHP71 each! Oooh la la! So for our Boracay trip, we only spent PHP846 for the tickets with free 15kg baggage allowance each for our Kalibo-Manila leg. Then came the 2nd week of August (last week). My excitement came to a halt when I’ve learned from one poster at the Pinoy Exchange Forums that starting September 10, 2010, AirPhil Express will not be flying to Kalibo anymore. There’s no formal advisory yet but when I tried to check their Kalibo flights, there are no available schedules from the said date onwards. Still not contented with the info, I checked our booking through their site last weekend and guess what, the status read, “NOT CONFIRMED”. Oh my! Nanaman? If you have read my Boracay Jackpot post then you’ll know that I’m a suki of flight disruptions whenever I’m bound for Boracay. But partly, I felt delighted with the possibility of being diverted to Caticlan. And so yesterday morning (August 16), I called up their reservations hotline to inquire about the available options for the cancelled flight. I asked if they can divert it to Caticlan instead since it’s the nearest airport but the agent told me it’s not included in the options. Grrrr. Okay fine so I just said “tawag na lang ako ulit” then hung up the phone. Me: Kuya may friend ka pa b s airphl? Lintik kc kinansel na nla kalibo flyts starting sep10. E nkbuk ako ng nov. Pwd lng dw idivert sa Iloilo or refund dw ng 30days. Ayaw nla pmyg na caticlan e sa bora nga pnta ko. Grrr. Me: Kuha mo txt ko? Me: andun pa ba ung mga officemates mo? Kuya: E d irefund mo na lang. Kuya: Ah may Caticlan na sila? Me: may B*** B*** sa fb baka siya yun? Kuya: dko Makita yung B*** B*** sa fb. Me: Ginoogle ko eh. May profile siyang ni-like. Baka friend niya yun. *thanks kuya but of course this would be my last option, nakakahiya naman sa presidente ko, “walang padrino” nga raw diba? lol. Anyway, a few PEx members shared the same problem, and one of them mentioned this morning that he was contacted by Air Philippines and was offered a third option and that is to transfer his flight to PAL. Hmmm… sounds good to me. So I immediately called their reservations hotline again and after a few tries, I was able to talk to an agent. He doesn't want to accommodate me at first and told me that I call 8559000 (God knows how many times I tried that number and had to deal with their irritating jingle but to no avail). So I said with a firm voice, "kanina pa ko tumatawag dun wala naman sumasagot, ikaw ang kausap ko ngayon, ikaw ang umasikaso ng booking ko!" "Sige Ma'am akin na po ang reservation code ninyo" (in short, gumana ang tactic ko) So in less than 5 minutes, our flight was transferred to PAL and on my preferred time. Not sure though if they allowed changing of dates. I grabbed the opportunity even if it’s still Kalibo because after all PAL has better planes and as of today, the cheapest Caticlan-Manila flights available via Cebu Pacific is priced at 3099+ taxes while AirPhil is at 1950+taxes. So dedma na. Super thanks to simply_owen of Pinoy Exchange for the tip. wow, ikaw pala yung lucky girl sa pex. i've read the complains too at nakakainis talaga madivert (lalo na sanay tayo sa cebupac na once naresked you get to choose a better date and a better time). teehee. kainis no? buti na lang talaga may 3rd option. pero kainis pa rin kasi i learned from my friend na yung naga outbound flight namin thru 2P for oct eh nacancel ang time (645am)so minove kami sa next available flight. suki ako ngayon ng airphil a. hahaha. by the way, i'm reading ur blog hehe. cool pics!